Figure 1. Hydropsyche, or net-spinning caddis fly larva, are one of the common invertebrate species found in the main stem of the Susquehanna River. Figure 1. Hydropsyche (caddis fly larva) nets on the bed of the Susquehanna River. [Photo: Benjamin R. Hayes]. State and federal agencies frequently conduct benthic macroinvertebrate surveys for bioassessment across large spatiotemporal scales. However, these data are rarely used outside specific regulatory agencies to address ecological questions. 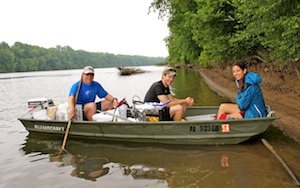 To account for differences in sampling, processing, and identification methods among agencies, we applied a standard method for standardizing sample size and resolving taxonomic ambiguities to 150 samples distributed across 10 locations in the Susquehanna River and major tributaries collected over 20 years by four agencies. Invertebrate communities were dominated by mayflies and caddisflies (45.6 to 83.2%) across all locations. Percent EPT and standard diversity measures were inversely correlated, indicating that traditional macroinvertebrate IBI approaches might not be applicable to large rivers. In addition to showing community composition shifts across subbasi ns, these data also document the spread of Asian clams (Corbicula) and the impact of black fly (Simuliidae) management. Large river invertebrates are understudied and, even with challenges of compiling multi-agency datasets, we show the value of applying these data to large river systems. We also suggest changes in future biomonitoring protocols to improve their effectiveness in bioassessment and ecological applications. Figure 2. 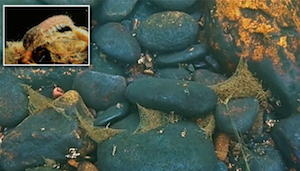 Seston refers to is the organisms (bioseston) and non-living matter (abioseston or tripton) swimming or floating in a water body. 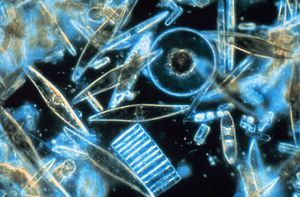 Bioseston commonly refers to plankton (shown above, as viewed under a microscope at 300 times) and abioseston refers to detritus in the river. The goal of this study is to examine the effects of filter-feeders on seston availability in riffles of the Susquehanna River. Conversely, we are also determining if seston availability affects density of filter feeders present at different locations along the riffle. 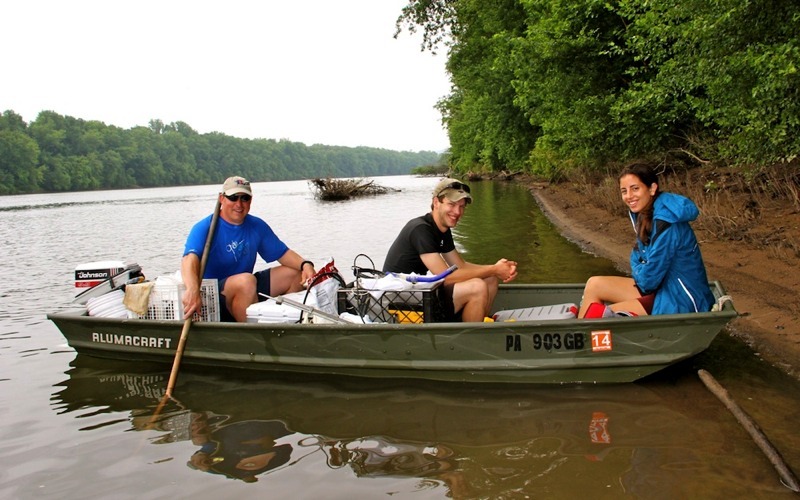 In summer 2012, we measured concentrations of suspended organic matter in six size fractions (0.7-1000 um) from water samples collected at 400-m intervals along a 1-mile long riffle in the West Branch Susquehanna River near Watsontown, PA. In addition, three invertebrate samples were collected at each site with a kick-net and were examined to see if the distribution of filter feeders along the riffle reflects locations with higher or lower seston amounts. The filter-feeder community was composed of dipterans, mayflies, and caddisflies. Total seston concentrations ranged from 1.28 mg/L to 2.2 mg/L throughout the riffle. Between 88 and 95% of seston was composed of the smallest size fraction (0.7-25 um). Our preliminary results showed that 87% of invertebrates at the upstream end of the riffle were filter feeders, 86% of which were caddisflies. Filter feeders comprised 77% of the benthic invertebrate community at the downstream end of the riffle, with caddisflies making up 74% of the filter feeders. Seston concentration did not decline along the riffle as predicted, which may be the result of rapid uptake of seston by filter feeders or turnover of seston pools throughout the riffle. We are studying benthic invertebrate communities in the West Branch Susquehanna River to explore how much community structure varies in space and to determine what factors influence this spatial variability. To this end, we have sampled benthic invertebrates in distinct microhabitats with dramatically different physical conditions (rocky shoals and sandy backwaters) with and without emergent vegetation (primarily water willow). We have also conducted extensive quantitative sampling in 10 riffles from Montoursville to Lewisburg to determine how much benthic communities vary within and among riffle habitats, potentially revealing localized patterns related to patterns within riffles, influences of tributaries on river invertebrates, or broad neutral effects across 40 km of river length. Samples have been collected and are in the process of being sorted and identified for both undergraduate and graduate theses. Figure 3. Biology professor Matthew E. McTammany (left) with graduate student Matthew Wilson (middle) and undergraduate student Ashley Bruno (right) conducting a macro invertebrate assessment of riffles on the West Branch Susquehanna River near Muncy, PA [Photo: Benjamin R. Hayes]. Figure 3. Biology professor Matthew E. McTammany (left) with graduate student Matthew Wilson (middle) and undergraduate student Ashley Bruno (right) conducting a macro invertebrate assessment of riffles on the West Branch Susquehanna River near Muncy, PA.